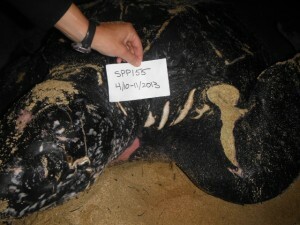 Damage to front shoulder in a pattern consistent with shark bite damage. The nesting season for leatherbacks (Dermochelys coriacea) at Sandy Point National Wildlife Refuge in St. Croix has been underway for three months. At this point, most of our turtles have nested at Sandy Point multiple times. Some turtles that have nested seven times already and still don’t appear to be finished for the season! It is an average of ten days between each nest that an individual turtle lays and we call this period of time the internesting interval. Past research indicates that the leatherbacks hang out off the waters of Sandy Point during the internesting interval waiting for their next clutch of eggs to become ready to be laid. 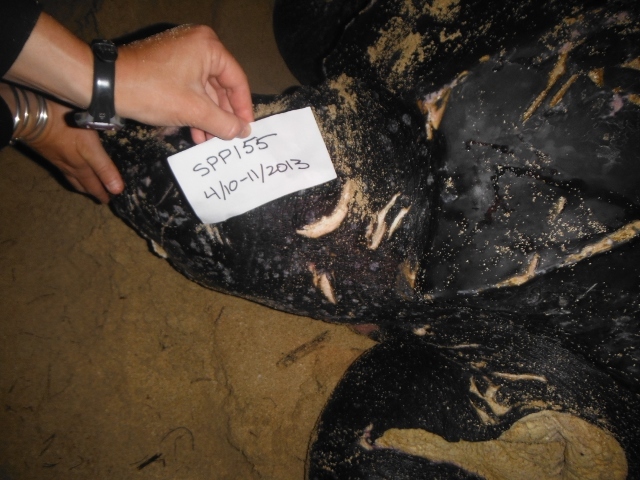 They don’t do much foraging for prey or diving during this time and so it seems that this would be a relatively safe time for the nesting leatherbacks. 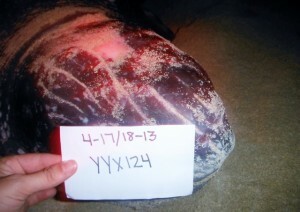 However, the injuries we document on some of our turtles tell quite a different story. It seems that sharks also swimming around St. Croix’s West End, and they sometimes attempt to prey on the turtles. 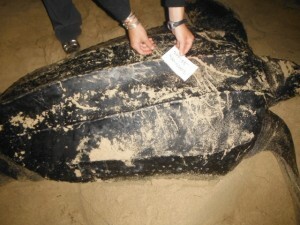 We have seen multiple turtles with massive lacerations on the shoulders and some have visible bite marks on the rear flippers. Since sea turtles cannot retract into their shells, the flippers are extremely vulnerable and this is where we most commonly see injuries from predators. 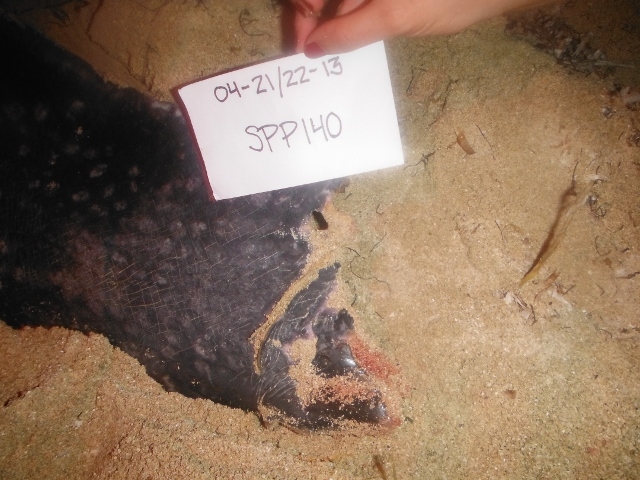 A couple of turtles even have bones exposed in the flippers from recent shark attacks. These injuries often interfere with digging an egg chamber because the turtle needs to use her rear flippers to excavate a hole in which to lay her eggs. Even though there is little we can do to help the turtle with her injuries, we can assist her with digging to make sure she has an adequate egg chamber and can lay a successful nest. One of our favorite turtles is one that was missing both of her rear flippers. Even though the injuries were old and healed, she could only dig about 15 deep centimeters in the sand, not nearly close to the 75 cm deep egg chamber that leatherbacks normally create. In cases like this, without any assistance, turtles will dig for about twenty minutes, which is usually the amount of time it takes to dig a typical egg chamber. 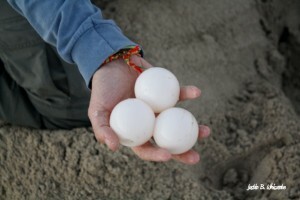 She will then lay the eggs in the hole and they will spill over and lay on the surface of the sand because the egg chamber is too shallow. Then when the turtle uses her body weight to pack down the sand of top of the eggs, a process called tamping, she will unknowingly crush the eggs she has just laid and destroy her own nest. This is unfortunate because even though the turtle is healthy and physically able to mate and lay eggs, she cannot produce hatchlings because she can’t make an egg chamber in which to lay the eggs. Fortunately, the biologists from Geographic Consulting encountered this turtle with the missing flippers just as she was emerging. We got behind the turtle and while she was digging, we scooped out sand to make her an ideal egg chamber. We were careful not to touch the turtle or disturb her and she never even knew we were there helping. After digging for a while, she started laying and filled up the clutch with 78 eggs. When she was done, we also helped her to cover the nest and make sure that enough sand was on top of the eggs to protect them. 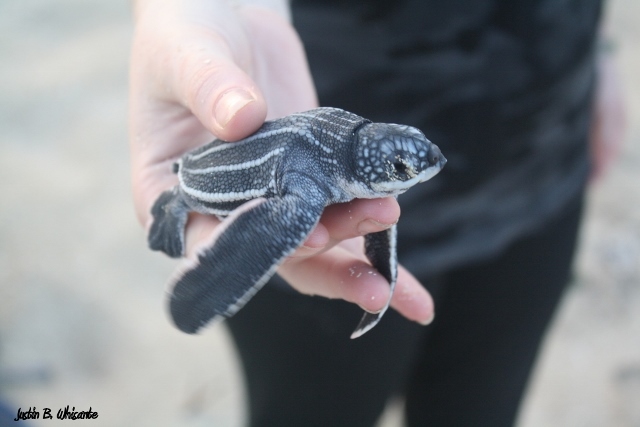 Last week, this nest hatched, and we released 58 hatchlings that otherwise would have never hatched into the ocean. Between instances like this and relocating nests laid in the erosion zone, we spend a significant amount of time on Sandy Point protecting nests to make sure that every turtle nests successfully. On many occasions I have seen turtles come up on the beach at Pelican Cove to lay their eggs during my morning walk around five thirty. While there are signs posted indicating a turtle nesting area, the beach becomes very populated with tourists and the turtles lay their eggs very close to the water line. I think the beach should be patrolled often and the eggs relocate to another location where they would stand a better chance of surviving. I would call John Farchette over at DPNR whenever see one laying but I still think more needs to be done.